Snap a photo of yourself with Machine Setia City photoboard at their photowall. Stand a chance to bring home great prizes every hour from 12pm - 3pm. 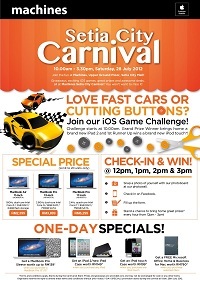 Visit Machines contest page for more details & remember to check out Machines Setia City Carnival great sale. Here's how you can do some charity on Colgate's Facebook page! For every Like, Colgate will contribute 50 sen; every Pledge, RM3; and every Share, RM1!